With the basic understanding of enzymes and digestion let’s look at what happens to your body over the period of one life-time. Your body was specifically designed to function on raw, enzyme-rich foods which support the digestive and metabolic enzymes found naturally in the body (see Enzyme Pyramid Chart on the left side). When enzymes are present in the raw foods you eat they “predigest” themselves and are readily assimilated. Think of what happens when you eat a salad for lunch. How long does it take before you’re hungry again? Now, let’s look at what happens when you lower your body’s enzyme level through eating enzyme-deficient foods. Enzymes occurring naturally in foods are destroyed by heating, cooking, pasteurizing or processing. At the bottom of the Enzyme Pyramid are the food enzymes received from the foods you eat. They are the most abundant and are the foundation of our health and longevity. When these food enzymes are not replenished on a daily basis, your body is forced to supply all of the enzymes needed to digest that cooked food. This is where the The Law of Adaptive Secretion that was established in 1943 is important. This law holds that an organism values its enzymes highly and will make no more than are needed for the job. These enzymes come from your digestive system or the second level of the Enzyme Pyramid. After years or decades of eating patterns that lack enzymes, your body will eventually use up its own digestive enzymes or the building blocks needed to make them. What may show up at this point are a host of side effects that include acid reflux, gas, belching, heartburn, indigestion, nausea and upset stomach. These symptoms are not a result of too much HCI and enzymes but way too few. 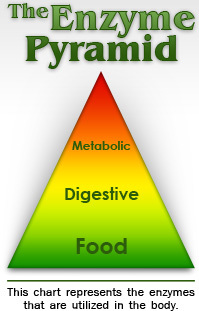 Your body has now used up the two lower levels of the Enzyme Pyramid. 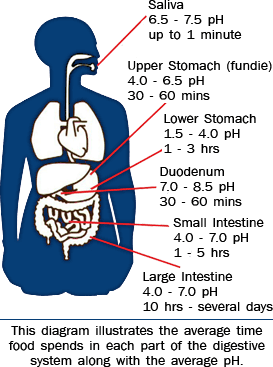 The pH in the human digestive tract varies greatly (see Human Digestive Tract pH Range Chart). The pH of saliva is usually between 6.5 – 7.5. After we chew and swallow food it then enters the fundic or upper portion of the stomach which has a pH between 4.0 – 6.5. This is where “predigestion” occurs while the lower portion of the stomach is secreting hydrochloric acid (HCI) and pepsin until it reaches a pH between 1.5 – 4.0. After the food mixes with these juices it then enters the duodenum (small intestine) where the pH changes to 7.0 – 8.5. This is where 90% of the absorption of nutrients is taken in by the body while the waste products are passed out through the colon (pH 4.0 – 7.0). With the basic understanding of enzymes and digestion let’s look at what happens to your body over the period of one life-time. Your body was specifically designed to function on raw, enzyme-rich foods which support the digestive and metabolic enzymes found naturally in the body (see Enzyme Pyramid Chart). When enzymes are present in the raw foods you eat they “predigest” themselves and are readily assimilated. Think of what happens when you eat a salad for lunch. How long does it take before you’re hungry again? Now, let’s look at what happens when you lower your body’s enzyme level through eating enzyme-deficient foods. 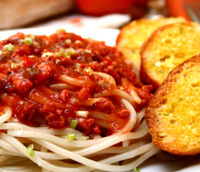 Enzymes occurring naturally in foods are destroyed by heating, cooking, pasteurizing or processing. At the bottom of the Enzyme Pyramid are the food enzymes received from the foods you eat. They are the most abundant and are the foundation of our health and longevity. When these food enzymes are not replenished on a daily basis, your body is forced to supply all of the enzymes needed to digest that cooked food. This is where “The Law of Adaptive Secretion” that was established in 1943 is important. This law holds that an organism values its enzymes highly and will make no more than are needed for the job. These enzymes come from your digestive system or the second level of the Enzyme Pyramid. After years or decades of eating patterns that lack enzymes, your body will eventually use up its own digestive enzymes or the building blocks needed to make them. What may show up at this point are a host of side effects that include acid reflux, gas, belching, heartburn, indigestion, nausea and upset stomach. These symptoms are not a result of too much HCI and enzymes but way too few. Your body has now used up the two lower levels of the Enzyme Pyramid. Do you stop eating now? 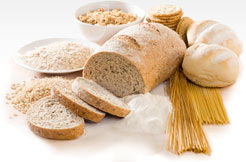 Fiber cannot do its job effectively unless enzymes do theirs. Over time, hard-to-digested high-protein foods (such as cooked meat and other enzyme-deficient foods) exhaust the digestive organs until they can no longer function efficiently. This results in the accumulation of partially digested food in the bowel. By middle age many people have as much as 20 pounds of undigested, putrefactive food in their colon. Toxins produced from this putrefactive buildup are reabsorbed into the bloodstream, creating autointoxication, or self -poisoning. This results in a dramatically weakened immune system and can lead to serious debilitating health problems including colon cancer. A good example of the importance of lipase activity lies in an interesting experiment with pigs. Veterinarians fed one group of pigss only enzyme-rich raw potatoes and another group enzyme deficient cooked potatoes. The pigs eating the raw potatoes did not get fat. However, the pigs eating cooked potatoes gained weight rapidly. 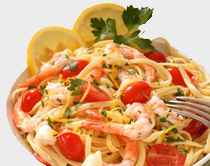 The regular use of digestive food enzymes that include lipase with meals often results in shedding excess pounds.